These photographs first appeared June 6, 2000. 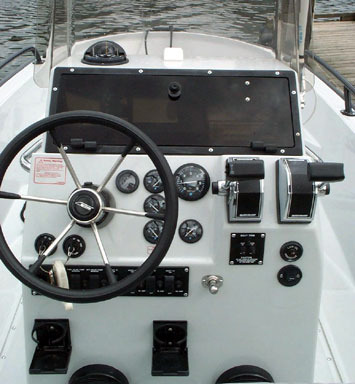 Louie Kokinis sent some more photographs of his Guardian 22, the Commercial Division of Boston Whaler Company's version of the Outrage 22. Louie has the boat set up for off shore fishing in the Pacific Northwest. We'll work our way from stern to bow. 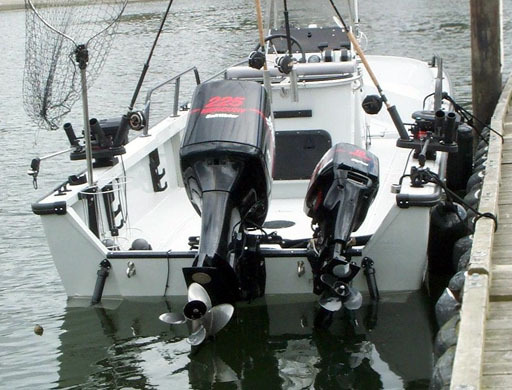 The boat is rigged for fishing with a 225 HP Mercury main engine and a 15 HP 4-stroke "Big Foot" Mercury auxillary/trolling engine. Scotty electric downriggers, rod holders, and landing net are on the gunwales. Any water that comes aboard quickly exits from the open transom. This picture is a great demonstration of Whaler's positive floatation: the boat is shown at rest with NO drain plug installed. Here is the view from the leaning post/pilot seat. 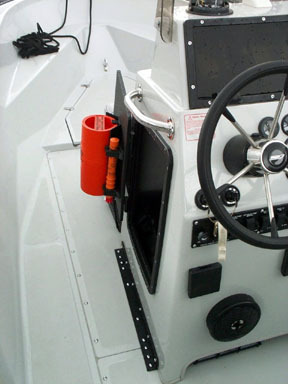 On the right are the dual throttle controls for main and auxillary, and underneath them the trim tabs and oil warning indicator. On the left a full set of gauges for the main engine, and underneath them the electrical panel. 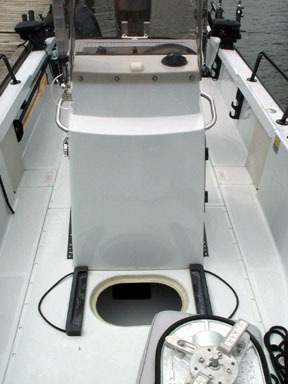 Electronics Box conceals GPS, Sounder, VHF Radio and Stereo. Wheel insert has the Boston Whaler logo, a nice touch. 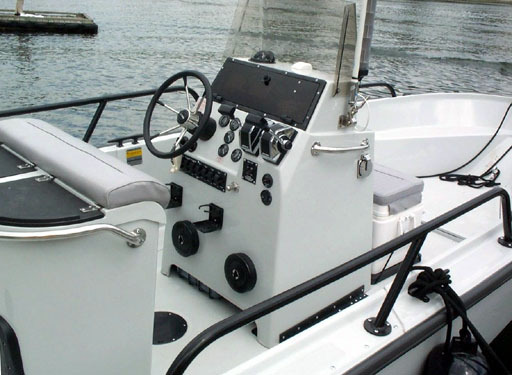 Marine Radio Antenna, Radar Reflector, 30-Amp Shorepower, Leaning Post, front cooler seat, and Grab Rails are shown. Open water-tight Bomar hatch leads to storage comparment. The hatch cover is sitting on the cooler which is normally secured above the hatch.